We all know what dolphins look like, but most of us have never seen a real-life dolphin up close, except for maybe at an aquatic show. Do you wonder how big dolphins can actually get in the wild? Among the more than 40 species of dolphins, size varies significantly. Dolphins belong to the Delphinidae family of the Cetacea order. Of the 40 species, six are commonly known as whales. They live in both saltwater and freshwater, and are found in every ocean. Most dolphins are less than 10 feet in length, though they range considerably in size, the smallest being the Maui dolphin and the largest being the orca, or killer whale. They are intelligent, social and playful creatures. The Maui dolphin is the smallest dolphin, measuring around 4 feet long and weighing approximately 90 pounds. In addition to being the smallest, Maui dolphins are also the rarest. The total population of Maui dolphins is estimated to be between a mere 48 and 69 individuals a year in age or older. This puts them on The World Conservation Union's Red List of critically endangered species. The killer whale, or orca, is the largest of the dolphin species and can grow to be about 25 feet in size and weigh up to 19,000 pounds. While the killer whale may not resemble his dolphin cousins very closely in appearance, he definitely shares in the family's trademark intelligence. Killer whales communicate with each other using a sophisticated system of distinctive sounds and noises that they can recognize from a distance. Orcas can live up to the ripe old age of 70 or 80 years. 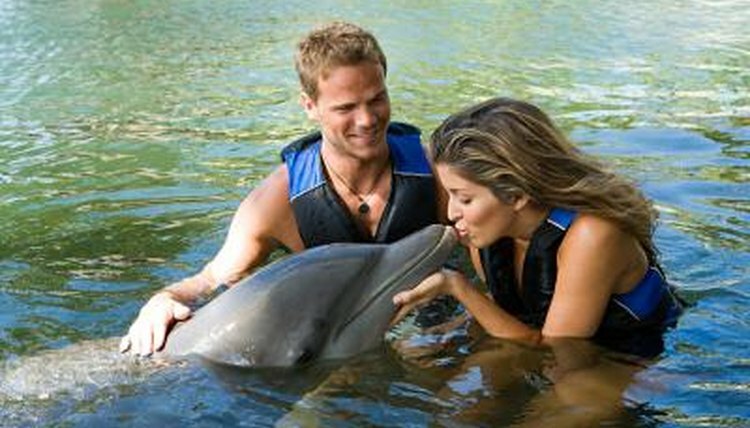 No doubt the dolphin that immediately comes to mind for most of us is the bottlenose dolphin. While bottlenose dolphins don't come anywhere close to their cousin the orca in size, they still reach an impressive stature of around 8 feet in length. They weigh between 440 and 660 pounds. They are well-known for their intelligence, agility and playful sociability. They live in social groups that can range from five to several hundred dolphins. They can live to be over 40 years old.